The most exciting news in my life right now is that we were finally able to replace our graphics/video card in our computer so I can edit and process photos to my heart's content. Therefore, I can share these photos taken at my parents' lake house at the end of May. Mimi was wanting an updated picture of Ethan in a cowboy hat. Photos like these might surface again in October since I am pretty sure that Ethan is going to be a cowboy for Halloween...we already have the hat and the boots so it kinda makes sense. What a cute lil buckeroo!! Glad you got some cute shots! You need to submit the one on the left to some cutest kid contest because it would win hands down!! 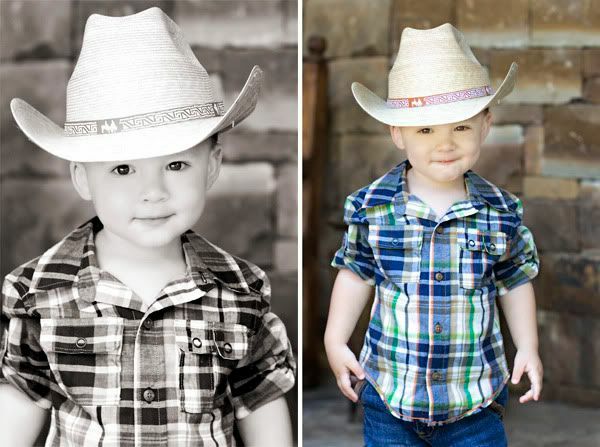 Definitely the cutest cowboy! All he needs is his little gun holster!